Seven books in one! 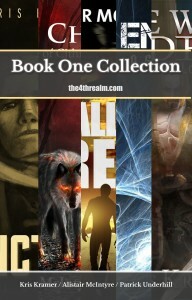 Get this amazing collection of books from the three authors of The 4th Realm! Get lost in Sanctuary, the Tales of the Lore Valley, Engineer, The Chosen: Rise of Cithria, Halflord, Shallow Creek, and Phalanx Alpha, all in one bundle, at a price less than half of the combined individual ebooks. Looking for epic fantasy, crime fiction, thriller, action, historical fantasy, science fiction, or sword and sorcery? Then you’ve found it all with this collection. This entry was tagged alistair mcintyre books, alistair mcintyre ebooks, book collection, book one collection, kris kramer books, patrick underhill books, the 4th realm, the4threalm. Bookmark the permalink.